Welcome to the amazing backgammon world where you can play for real money or for fun absolutely free of charge. Our room is one of the biggest online and you can play with thousands players from all over the world any moment. The software offers classical backgammon (tavla) for 2 players with perfect 3D graphics and sound, the board is set in a traditional wood colors. Playing with others you can see their national flag and skill level. ...... You can choose the mode you would like to play: to complete with any other player or to participate in tournaments. There are few types of tournaments available: Sit and Go, Event, Swing, Satellite and KnockOut. 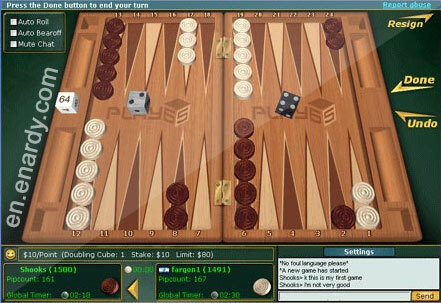 PC Backgammon Online is a logical table game. And only at first sight one may have an impression that a lot can depend on luck. In reality despite of dices combinations to be rolled, the most experienced and the strongest player often wins. The knowledge will be obtained with an experience but if you are just a backgammon beginner, learn carefully theoretic information presented on the pages of our site. Having downloaded and installed backgammon, start playing with the opponent as good as you are. Keep on perfecting your skills while watching the games of the players with higher ratings and start playing against stronger opponents. Having got all the necessary knowledge and experience, you can surely start playing backgammon for money. Qweas is providing links to PC Backgammon Online 2.1 as a courtesy, and makes no representations regarding PC Backgammon Online or any other applications or any information related thereto. Any questions, complaints or claims regarding this application PC Backgammon Online 2.1 must be directed to the appropriate software vendor. You may click the publisher link of PC Backgammon Online on the top of this page to get more details about the vendor.